At this time there is increased regulatory pressure for institutions to only use capital models that they control and understand in full detail - i.e., not to use vendor models that are 'black boxes'. 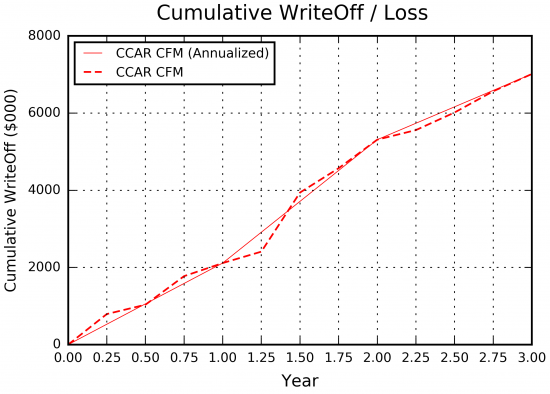 For this requirement the CCAR CFM provides full transparency and is easily accessible to the institution's commercial real estate analysts through its simplicity and easily understandable risk calculations. The quarterly nature of the model allows both for simple set-up of relevant regulatory - or internal - stresses as well as direct reporting of all relevant metrics on quarterly time-steps. The underlying model is also presented in an Excel form so that all equations and assumptions can be understood, checked and modified if needed. The quarterly nature of the CCAR CFM provides granular insight into how the institution's CRE portfolio will react to the very specific stresses detailed in the regulatory CCAR and DFAST stress-testing exercises (see above). Furthermore, by leveraging the full reporting capabilities of the SFS, the CCAR CFM also provides a detailed breakdown of various risk components (e.g. interest rate risk, lease risk, tenant risk and refinancing or term risk) at the portfolio or sub-portfolio level (see Dissecting CRE Loan Risks) along with easy identification of leading loss contributors within the portfolio. Dr. Peter Andresén, Risk Integrated's Head of Methodology, commented that "We are very excited to provide a quarterly cashflow simulation solution for CRE that will not only allow institutions to effortlessly meet the regulatory CRE reporting requirements but also provide insights into their CRE portfolio for additional business value". Risk Integrated's CEO, Dr. Chris Marrison, noted that modular nature of the SFS allows for the CCAR CFM to easily be slotted in alongside more a the more comprehensive SFS CFM thereby providing a comprehensive CRE solution for institutions that provides consistency across internal CRE grading and regulatory reporting: "The comprehensive nature of the Specialized Finance System is clearly evident given the possibility of running several tailored analysis alongside each other, each providing specific insights".